No other type of floors has the unique combination of beauty, warmth, and comfort provided by hardwood floors. Yet over time, hardwood can take a beating. Even with the utmost care and cleaning, hardwood floors will lose their luster and color through routine use. At that point, you’ll need to think about your options for wood floor restoration. When restoring hardwood floors, homeowners have a choice between a do-it-yourself approach and hiring a professional restoration company. Many homeowners initially gravitate toward the DIY approach, which can be cheaper than hiring an outside service. But when you consider the kinds of mistakes that you can make on a wood floor restoration project — like the 7 examples listed below — you might want to rethink tackling the job by yourself. 1. Wrong Equipment. 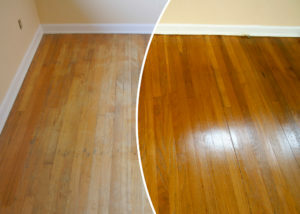 Typically, wood floor restoration starts with sanding the floor. This strips away the previous finish and removes surface-level scuffs and scratches. However, if you attempt the job with home power tools, you’re liable to sand your floors unevenly or damage the wood in severe ways. To sand wood floors, you’ll need a drum sander, which you can rent from a home improvement store. 2. Uneven Sanding. The proper sanding equipment will reduce the risk of damaging your floors. But even with a drum sander, sanding mistakes are easy to make. Under-sanding can leave spots of old stains or finish, leaving these areas unsuitable for refinishing. Over-sanding can be even worse for floors, leading to divots or scratches that only a professional can fix. 3. Improper Edging. A drum sander won’t be able to reach the areas directly next to walls/baseboards. For these areas, you’ll need an edger, which is designed to accommodate tight spaces. Edging can be tedious and exhausting work, especially after you’ve already spent several hours using a drum sander. Because of this, many homeowners rush these areas during wood floor restoration. This results in a noticeable color/texture difference around the edge of the room, with a higher risk of degradation. 4. Lingering Wood Dust. Traditional wood floor restoration produces significant amounts of wood dust, which becomes a serious issue when it comes time to apply the stain/finish to your floors. If you haven’t properly cleaned your floors, and if wood dust particles remain airborne, these particles will become embedded in the stain/finish. As such, it’s important to vacuum up as much dust as possible, then give your entire room a detailed cleaning before applying any kind of stain/finish. 5. Wrong Products & Materials. There are a lot of different types of stains/finishes available at your local home improvement store. That can make it easy for DIYers to choose the wrong product for their needs. Certain types of stains/ finishes are unsuitable for certain types of woods, and others are specially formulated for specific uses. Choosing the wrong stain/finish could give your floors an unappealing appearance or could result in accelerated wear or discoloration. 6. Improper Application. Just as choosing the wrong stain/finish can compromise your floors, so too can improper application of these products. Make sure that you follow each product’s instructions as exactly as possible. Take care to apply the product evenly and allow it to dry completely before applying additional layers or using your floors. 7. Health & Safety Concerns. Traditional wood floor restoration methods can be dangerous for the health and safety of your family. The two biggest concerns are wood dust and VOCs (volatile organic compounds). If inhaled, wood dust can cause serious respiratory issues. Meanwhile, stains/finishes tend to produce toxic VOCs, which are damaging to both your respiratory health and the environment. Should You Hire Wood Floor Restoration Professionals? 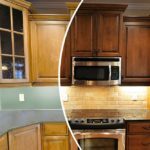 If you’re concerned about lackluster results or serious damage, it’s a smart idea to hire a professional refinishing service. 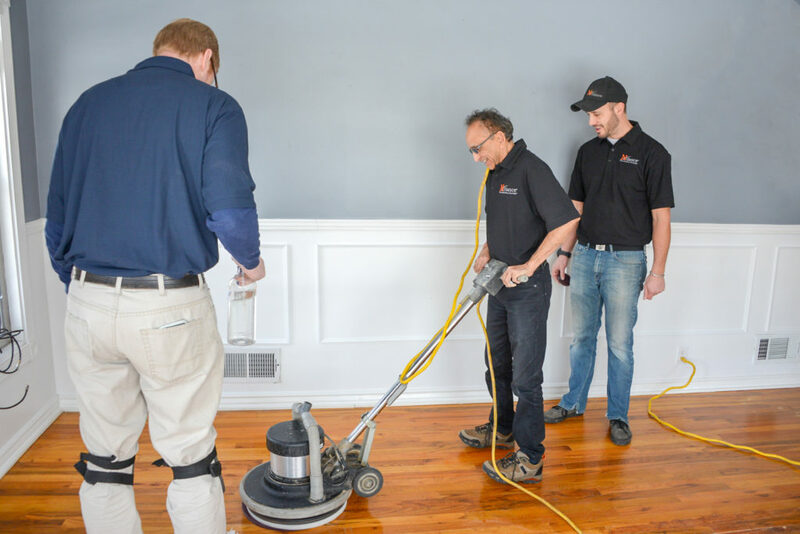 Wood floor restoration professionals not only have higher quality equipment and materials, but also have the expertise and experience that your floors deserve on a refinishing project. At N-Hance®, our wood floor restoration services are an ideal fit for all different kinds of hardwood flooring as well as non-sandable floors like bamboo or cork. Thanks to our unique restoration process, we can restore your floors in a fraction of the time of traditional floor refinishing. 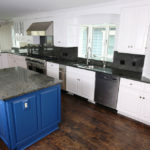 What’s more, our restoration process produces zero wood dust and minimal VOCs, making us perfect for homes with pets, young children, or family members who have respiratory difficulties. Contact N-Hance today at (855) 642-6230 and request a FREE estimate on wood floor restoration.